Valeant Pharmaceuticals has had an incredibly hard time in the market as of late, and for good reason. Late last year, it was uncovered that the company was using its relationship with a pharmacy to fluff the numbers and make it look like it was doing better than it actually was. However, we’ve seen quite a bit of change since the scandal. So, I believe that we’re finally nearing the bottom of the declines. Today, we’ll talk about the scandal, what’s changed since, and what we can expect to see from VRX moving forward. Late last year, an analyst firm known as Citron decided to do some digging into Valeant. After all, the company had come under fire for pricing practices, but the stock was climbing. When Citron released their report, it was something that no one expected to see. According to their report, VRX and its biggest client, a pharmacy known as Philidor were giving false statements to investors. In fact, in the report, Citron called Valeant Pharmaceuticals the Enron of the pharmaceutical industry. While I didn’t want to believe the claims, more and more evidence came out proving that VRX had indeed done the wrong thing. Soon, the stock started to fall like a brick dropped from the empire state building. Unfortunately, there was no denying the facts anymore, it was time for Valeant to admit to the wrong doing, and make some changes. Once the Philidor scandal was uncovered, VRX found themselves trapped between a rock and a hard place. The company had to admit that it had done wrong, and make changes to make things whole again. That’s exactly what happened. Here are some of the changes we’ve seen since the Philidor scandal. Philidor Agreement Was Canceled – Shortly after the news surfaced, VRX announced that it had canceled the agreement it had with Philidor. Of course, this excited investors, but it also meant that the company was giving up its biggest customer. Walgreens – Valeant knew that without Philidor, it had to come up with something to keep sales rolling. After all, the pharmacy was their biggest customer. However, shortly after the news that the agreement between VRX and Philidor had been canceled, we heard the announcement of a new agreement. Walgreens had agreed to sell Valeant products. Although this didn’t make up for sales loss completely, it did put a big dent into the lower sales volume issue. Board Changes – As time passed, it was clear that VRX needed changes to management. After all, the management at the company allowed the scandal to happen. As a result, the company announced the addition of two activist investor board members. CEO Changes – When it comes to things going wrong at a company, the end of the blame lies with the CEO of the company. As a result, it was announced recently that J. Michael Pearson would be stepping down from his position as CEO of VRX. In his place, Joseph Papa was named the new leader of the company. At this point, I’m incredibly impressed with the changes that we’ve seen at Valeant Pharmaceuticals. While it is going to take time to win back the trust of investors, the company is clearly headed in the right direction now. All in all, I’m expecting to see long run gains on the stock. Where do you think VRX is headed and why? Let us know your opinion in the comments below! 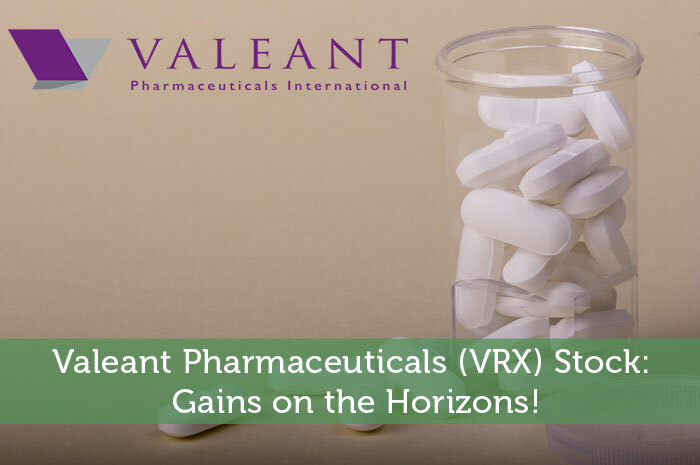 Valeant Pharmaceuticals (VRX) Stock: Gains on the Horizons! The biggest problem is the 30 billion $ loan. With the price reduction of many drugs and no more acquisition in the pipeline, going forward it would be an uphill battle for VRX to grow.